This document describes a unified approach to Assistive Technology (AT) and Augmentative and Alternative Communication (AAC). Its principles derive from (a) statutes that regulate districts, and (b) best practices adopted in common. Review by local colleagues informed its creation, and we continue to solicit feedback. We are also drafting a separate, less formal description of these services, as our original intent was simply to help familiarize colleagues at non-district agencies with district life. That version will be linked here on completion. Oregon is a local control state, where each district determines how they will implement the rules. The Lane County Special Education Directors have reviewed this material, and they support the consensus that it represents. As a unified article, then, no proposed changes of any significance will be incorporated without first being made available here for participant review. If supporting districts pose no objections for a year beyond the date of proposal, then the changes will be incorporated. Licensed specialists serving Lane County districts wrote this document, and all but one of the Special Education directors support this consensus. We describe a unified approach to Assistive Technology (AT) and Augmentative and Alternative Communication (AAC) whose principles derive from (a) statutes that regulate districts, and (b) best practices adopted in common. Some of these constraints are specific enough to districts that they can be unfamiliar to people in other venues. In the authors’ districts, AT/AAC specialists enjoy an easy camaraderie. While we talk often about our procedures and write coordinating documents, we have not previously written about the material with which we are mutually well familiar. In the interest of extending that partnership to the broader community of our colleagues, it is important now to make our shared approach explicit. The better that our districts and the local agencies understand each other, the more consistent our service will be to our clients and students. Agencies are sometimes unfamiliar with the laws regulating school districts when they are not bound by similar constraints; in other words, exposure to the districts’ policies and procedures is not routine. In that context, agencies sometimes make decisions about a student’s equipment without accounting for the districts’ gatekeeping obligations. When that equipment is not automatically adopted into the classroom, unnecessary conflict can damage the relationship between districts and families. Improving the access to information about the districts’ responsibilities should promote informed decisions, and avoid some of these unpleasant situations. Similarly, we would appreciate reciprocal information that would help us to accommodate the constraints binding other types of agencies. All of us want to minimize these risks while optimizing appropriate tool selection; with that goal in mind, the districts have created this description of their unified approach. Originating with the ‘Free’ in ‘FAPE’, a district must ensure the provision of educationally needed AT materials and services “at no cost to parents” (except for surgically implanted devices). In this section, we will discuss the district’s funding constraints because that issue touches on non-district entities, then in the next section we will talk about determination of that need. While it is legal for districts to “allow” parents to volunteer or donate resources, appeals to personal insurance (including Medicaid) run a significant risk of consequences that are not legal; fundamentally, the district must be absolutely clear with parents about the parents’ simple right to refuse. Once a parent says ‘no’, any continued discussion amounts to the district trying to persuade the parents to assume some financial responsibility, which is simply not allowed. If the parents do volunteer their insurance, there are risks. The district must absolutely (i.e., not just “thoroughly”) protect the parents from incurring any cost at all, both now and in the future. Dispensing insurance advice lies well outside of a district representative’s scope of practice, so the only way to responsibly protect the parents is to mutually consult with an actual authority on such costs as depletion of lifetime caps, changed premiums, pre-existing condition exclusions, policy discontinuation, and any other complex potential cost pitfalls. For districts, the safest route is simply not to broach the topic of parental insurance in the first place. That said, parental insurance is commonly addressed if durable medical equipment (DME) overlaps educational AT functions; for example, when a wheelchair is needed for educational AT, a personally-owned wheelchair tends to be in place already for medical needs. Crucially: if the district allows such equipment to serve an AT function, then it assumes responsibility for the equipment’s continued availability for that function. If it then breaks down or needs replacement, the district can continue to allow the parents to volunteer funding, but if the parent declines to continue, then the district has to step up in the manner described above. The replacement equipment might not be identical, but it must provide the needed educational AT function. This issue is important here because some AT/AAC is also DME (as discussed below). A district is not allowed to shift their financial responsibilities onto less-constrained agencies; therefore, once a district adopts a device, no matter how (or by whom) it was originally funded, the district becomes financially responsible for its maintenance and replacement to meet educational AT needs. A district restricts its influence over future tool selection if it allows the use of externally-sourced equipment without a district evaluation; that is to say, precedence is set, and the district is then responsible for maintaining and replacing equipment that was never subjected to district review. District-funded replacements are district owned. Such a “donated” device tends to be unique in an otherwise consistent framework, requiring more than its fair share of resources to maintain; therefore, an inconsistent device should only be adopted if no consistent equivalent will provide the needed functionality; to be clear, framework inconsistency is not a basis for disallowing functionally necessary devices. Inconsistent devices are not a “free gift” for the district if they unnecessarily deplete more resources than consistent ones do. So while third-party, non-parent donations of consistent devices can be appropriate, they should still be assessed by the specialist/team. Finally, a default policy of allowing adoptions runs licensure risks (both for districts and other agencies), in that specialists feel pressure to use devices even when they were procured without their involvement. That risk increases when the originating process did not align well with the specialist’s standards. When providing services, SLPs (in specific) are legally and ethically bound to exercise independent professional judgment, explicitly without regard to referral source or prescription (see Appendix A4); therefore, abiding by those standards should not be constrained by contentious discussions. The easiest way to reduce this risk is for specialists across agencies to coordinate their efforts. “Need” has a legal definition tied to FAPE: when the courts originally identified average performance as the standard for need, consistently average performance was evidence of FAPE access. Courts have now raised that standard to include challenges at the “least-dangerous decision” level while evidence is gathered (i.e., what is least likely to have risked substantial harm if the educated guess proves to have been wrong in the interim). That metric helps to keep opportunities for growth both available and reachable. Balance is the key, erring neither too far on the side of caution nor of daring. Access to opportunities for growth is a need that should never be restricted by any presumption of inability. As AT/AAC helps to provide that access, it must always remain open-minded and informed in its approach to ability. Districts can be generous with AT support beyond this need, evaluating such decisions in terms of risk. The districts’ determination of need begins with a student evaluation. A parent can solicit an AT evaluation by a non-district agency (at their cost) if they disagree with the one presented by the rest of the IEP team. A student AT evaluation is a necessary precursor to any informed discussion of tools. We examine (a) the student’s strengths and challenges in light of (b) the specific set of environments in which (c) we expect the student to engage in certain tasks. Only after we have all of that information do we enter the process of vetting tools. 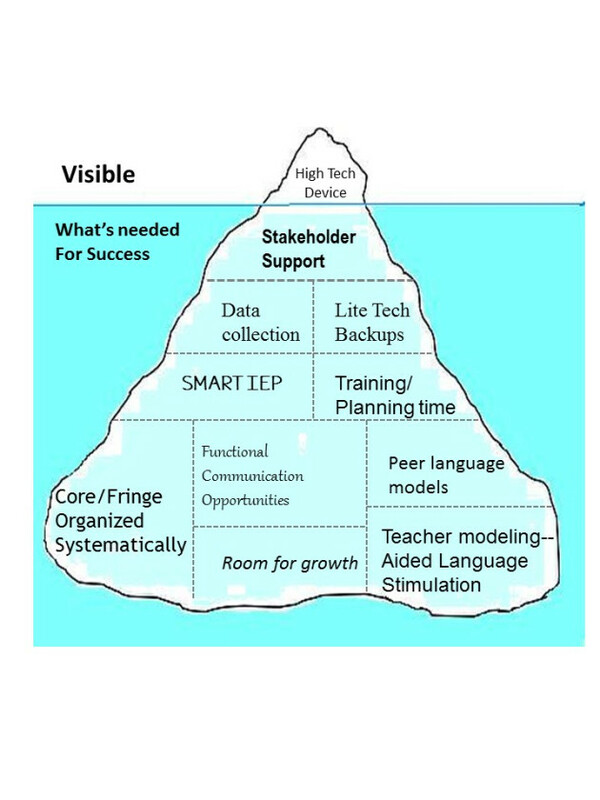 This is known as a SETT analysis (Student, Environment, Tasks, Tools), which in its most elaborate form is a meeting of the entire IEP team (and then some). While we have found a full SETT meeting to be valuable in some specific cases, usually we overlap the IEP meeting. Subsets of that team address other specific needs as they arise, but with the same SETT-style approach. Following this path helps to avoid falling prey to the “tool-first” fallacy, which attempts to select a student to match an existing device (by waxing enthusiastic about the properties of the “golden hammer”). We explore a student’s talents with fully open minds and hearts; to do otherwise would present an unacceptable risk for our students. Despite some recent progress, contemporary society still too often judges a book by its cover; therefore, the phrase “presume competence” continues to play an important role as a rallying cry. No student should ever be denied access to AT/AAC on the basis of presumptions about their perceived limits, or by making an appeal to any other type of inadequately informed decisionmaking; in fact, the focus of the process should never be grounded in denial, but rather in an exploration of provision potentials. Every student is presumed, then, to be able to benefit from AT/AAC. On that foundation, we build increasingly evidence-based decisions about specific tools. When that evidence is not yet available (or perhaps not reliable), we make the least-dangerous decisions that support scaffolds for growth (i.e., just out of reach) while mitigating long-term risks associated with potential frustration and rejection (i.e., too far out of reach) and a subsequent need for unlearning. That informed environment allows us to optimize the balance of risks and benefits to the student. a student’s device preference is not a deciding factor (but this “want” might be accommodated if it is otherwise harmless). Some AT needs are best associated with a specific service domain; for example, an orthopedic impairment (OI) need for a pencil grip would likely be best addressed by the Occupational Therapist (OT) who provides services for the district, and not by the district’s broader AT specialist. This approach not only helps to protect the student, but lets a district maintain a program-wide device inventory, keeping their resources all up-to-date and in good repair with appropriate licensing. It helps to protect against wasting FTE when a one-off device or software title (relative to that inventory) is not actually needed. The fewer resources that we spend on an unnecessarily divers inventory, the more resources we have to distribute across all of our students. Again, and more importantly, this process protects against ill-informed timing: if a student does not have skills in place that are reliable enough to access their growth challenges on a specific device, then their frustration can create such a barrier that they might not want to use the device again. This risk is not an exaggeration: some of our students have experienced this mismatch, so we need to avoid any emphasis on toy value, or on tools that actually outstrip a student’s capabilities (rather than providing a healthy challenge for growth). Our student-first process is proven to promote success and sustainability. While some districts are pursuing a “bring your own device” policy for general education (e.g., gifting their students with devices and apps that their students take with them after graduation), this is not a matter of student need; for one (significant) thing, a general education student can access FAPE without this assistance. The special education context, then, is absolutely different in this regard. The question of AAC as DME is more specific in nature, and is addressed hereafter. for more general use, such as with an iOS device, or a more conventional computer, with communication software. When a piece of single-purpose AAC equipment is also a speech-generating device (SGD), and a physician prescribes it, then it can be durable medical equipment (DME) for Medicaid funding. While a NovaChat or Dynavox would be included in this class, general-purpose devices currently would not. Since July 2015, the presence of email and texting functions does not disqualify an AAC device for Medicaid funding. To qualify as DME through insurance, a statement must be submitted to the insurer in which the medical necessity of the SGD is identified; typically, the evaluator contends that the client has a need for assistance with communicative expression in a medical setting, such as to describe the location and intensity of pain, and so on. Crucially, this qualification applies only to self-driven expression, and not to methods where a partner composes the client’s messages, whether that partner does so by using the system directly, or by exerting control over the client’s body to use the system indirectly. Such partner-driven methods are known as facilitated communication, which — as repeatedly proven in the research — delivers only the partner’s messages, and not those of the client. A trial is necessary, then, to demonstrate that the client can already use the recommended device to benefit from self-assisted expression. In this regard, SGDs differ from most other types of DME (e.g., a wheelchair, an oxygen-delivery system, and so on), as a client can receive partner-controlled benefit from most DME without needing to be able to operate that equipment on their own. Insurance funds DME on the basis of the benefits that it currently makes available to the client, and does not fund DME solely for benefits that might only pertain in the future. (A district has more leeway in this regard, such as devices assigned for trials and training.) Care must be taken not to procure an SGD with “added features” or “room for growth” if there is insufficient evidence of the client being able to “grow into it.” An appeal to insurance affects this risk assessment, in that the device has to last for a few years (typically five) before being eligible for funding again, and the inability to predict accurately that far into the future promotes some reliance upon educated speculation. Decisions are based only on present performance levels (which must include a projection of accessible challenges). The district updates device assignments whenever ongoing trials (and new present levels) show evidence of changed needs (i.e., without multiyear funding blackouts). Among the devices that might be appropriate for a student, one of them might (a) be consistent with the technology framework, and (b) also happen to have room for potential growth (i.e., a possibility for growth exists without specific evidence). In such a case, the district’s display of generosity beyond the student’s present need would balance well with a frugal framework. However, the criteria for the district’s generous decision should be explicitly documented as a consequence of fiduciary responsibility; otherwise, the district will have created a “policy” where tools are assigned for reasons beyond a student’s present needs. That is not supportable. The district might come across cases where such a device is already in place to suit medical needs; however, unlike a wheelchair (for example), the medical aspects of a special-purpose communication device might not be necessary at school, especially if the student is not yet using it to express medical messages (i.e., the student has not “grown into” using it for medical expression). Sometimes a system’s medical profile was originally only highlighted by the procuring specialists to help access the parents’ insurance, and the equipment is actually used for more general purposes. In such cases, the district might find that a general-purpose device would meet the educational AT needs just as well. Naturally, that decision depends in significant part upon the student’s current proficiency with the existing device. There are cautions, then, around who provides AAC devices. If a student enters the district with an inconsistent device, but has already built significant proficiency in using it, then there are good reasons to let it stay in place (after the required evaluation). Once the district adopts this inconsistent device, however, they become responsible for maintaining it. And silence betokens consent: failure to actively reject the device counts as adopting it. But when it comes to selecting a new device, if all other factors are equal, then a consistent device will save resources that can be put towards meeting other needs. It would help the district, then, if an external agency would take that consistency into account during device selection and contact the student’s school team, especially because that agency faces fewer legal constraints when allocating the parents’ insurance. It should be noted that the Office of Special Education Programs (OSEP) explicitly identifies such “personal items” as hearing aids (1993, Policy Letter to Seiler, 20 Individuals with Disabilities Law Report 1216) and eyeglasses (1995, Policy Letter to Bacchus, 22 IDELR 629) to be part of the district’s responsibility when such items are identified in the IEP as required for FAPE. Such items would then be district property, however, and subject to selection by the district’s specialists. In other words, if parents specifically wanted a pair of eyeglasses to meet the criterion of being fashionable (or they wanted to fulfill any other non-need criterion), then they would have to get those on their own. Systems vary in the skills on which they must rely for effective communication. Some such skills are more common than others across categories of devices. For example, the ability to sensorily scan a presentation field is one such skill, and then the ability to select a desired target from among distractors. These skills are common across various grid- or array-based systems because they tend to define their design. So, to be clear: no student would be denied access to communication supports even if such skills were not reliably in place. We would still search for the most appropriate scaffold. While some advanced devices can be used to help train some basic skills which are not yet reliable, those same skills (by the same token) would not be available reliably for AAC on that advanced system. This is a context in which the availability of growth opportunities must be weighed carefully; that is to say, this is another risk analysis: with or without using AAC, people typically continue to train (or hone) their communication skills across their lifespan. So even though their systems are never expected to be entirely reliable, they still fare best when learning with systems that are fundamentally and mostly reliable, which describes a continual context of growth opportunities. A device that is dedicated in significant proportion to training, then, is not really an AAC system, and might not need formal support from an AAC specialist. This is the sense in which we tend to look for a set of reliable skills before putting formal AAC services in place, albeit motivated exceptions exist. Those skills are described in the checklist for basic communication. Those descriptions are easily turned into measurable IEP goals and objectives. During the development of these skills, the student’s classroom SLP will often bring in devices to see what the student’s interactions will be, and assistive communication systems will be in place. This is one area where the principle applies of making least-dangerous decisions that will provide challenges while learning. The parents sign that document. The classroom SLP submits a request for a formal AAC evaluation to the AAC Specialist. The AAC Specialist shepherds that request through the district signature process that acknowledges the AAC evaluation (because there is an additional fee for service). An AAC evaluation, then, is not associated with AAC services on the IEP. The AAC Specialist uses a further set of specific criteria to help determine which type of device might be most appropriate for their trials with the student. The AAC evalulation and associated trials tend to take 6-12 weeks, after which the AAC Specialist submits a report conveying their recommendations to the IEP team. The IEP team decisions about those recommendations affect the IEP. Naturally, there are educational uses for general-purposes devices beyond AAC. A device tends to be treated as AT when the student does not rely on it for their communication (e.g., a use other than to augment their voice), because that use does not have to be supervised by an SLP. These uses are often described as helping the student to maintain, increase, or improve their functional capabilities. This includes any improved access to their specially designed instruction and their education in general. Unlike AAC, AT service is included in the Life Skills package, so there is no need for a formal request for an AT evaluation to receive those services. The AT Specialist will take a look at the abilities that the particular student draws upon to perform their required tasks at school. If the results of the trials support the selection of a certain tool, then the district will supply it. There is no need for a parent to buy a device or software for classroom use. While this same device can also be checked out for home use, it needs to be available for daily use at school, including already being charged when the student arrives. The district will also provide the software. Software licensed or “owned” by a district cannot be put on privately-owned devices. Any change to the classroom’s computational framework requires oversight by a district’s Technical Services department. This includes various tablets and SGD-style devices, as they are computers. The Technical Services departments in the authors’ districts have approved the AT/AAC evaluation process used in the Life Skills classrooms that they support. The following appendices present frameworks and regulations that guide our decisions. The skills described in this section should be reliable before referring for an AAC evaluation. (This list was derived several years ago from materials originating with Willamette ESD.) If they are not reliable, then an AAC evaluation will only tend to reveal the need for further focus on these fundamentals. It doesn't take an AAC Specialist to report that observation. The question is “How reliable?” When an AAC system cannot rely on these skills, it is just a training tool, and most actual AAC systems do not make good trainers for these fundamental skills. While room to grow is a necessity, and stretch is good, strain is bad. An appropriate tool will scaffold these in balance. So, if these essential skills are not in place (~90%), then there are better assistive comm materials whose sophistication would match the user’s projected capabilities and growth opportunities. A voice-output communication device (VOD) will only provide consistent benefit if the following skills are reliable, otherwise it acts as a training tool. As this document might serve as a reference for district representatives, we include the following regulatory material. Our comments are set apart in italics to distinguish them from direct citations, and bolding of the original material is our own. Districts must provide AT at no cost to parents. See section 3.a (below) regarding the determination of “functional capabilities” mentioned in section 2. The definitions below apply to OARs 581-015-2000–2999, unless the context indicates otherwise. (2) “Assistive technology device” means any item, piece of equipment, or product system, whether acquired commercially off the shelf, modified, or customized, that is used to increase, maintain, or improve the functional capabilities of a child with a disability. The term does not include a medical device that is surgically implanted, or the replacement of such device. (b) May involve physical education services, speech language services, transition services or other related services designated by rule to be services to meet the unique needs of a child with a disability. (b) To ensure access of the child to the general curriculum, so that he or she can meet the educational standards within the jurisdiction of the public agency that apply to all children. AT must be made available at home if the student needs it to access FAPE. (1) School districts must ensure that assistive technology devices or assistive technology services, or both, are made available to a child with a disability if required as a part of the child’s special education, related services or supplementary aids and services. (2) On a case-by-case basis, the use of school-purchased assistive technology devices in a child’s home or in other settings is required if the child’s IEP team determines that the child needs access to those devices to receive a free appropriate public education. For the purposes of OAR 581-015-2700 to 581-015-2910, the definitions in this rule and 581-015-2000 apply. (g) Include the following types of intervention services (defined in 303.13(1): family training, counseling, in-home visits; special instruction; speech-language pathology and audiology services, and sign language and cued language services; occupational therapy; physical therapy; psychological services; service coordination; medical services only for diagnostic or evaluation purposes; early identification, screening, and assessment services; health services necessary to enable the child to benefit from other early intervention services; nursing services, nutrition services, social work services; vision services; assistive technology devices and services; and transportation and related costs that are necessary to enable a child and the child’s family to receive another early intervention service. (1) Contractors or subcontractors must follow the rules and procedures in OAR 581-015-2055 to ensure that assistive technology devices or assistive technology services, or both, are available to preschool children with a disabilities age three through the age of eligibility for public school, if required as a part of the child’s special education, related services or supplementary aids and services. SLPs cannot let non-SLPs perform their professional work, so they cannot let non-SLPs perform AT and AAC evaluations, or otherwise let them make decisions about these processes. (3) Individuals shall not transfer to a noncertified individual any responsibility which requires unique skills, knowledge, and judgment that is within the scope of practice of that professional. (2)(g) Unprofessional conduct means [a]ssisting or permitting any person to practice speech-language pathology or audiology without a license. SLPs cannot adopt outside systems without performing an independent evaluation. (6) Individuals shall not provide professional services without exercising independent professional judgment, regardless of referral source or prescription. While IEP team member participation is valuable and necessary, ultimately an SLP has to perform the actual evaluation and render the associated decisions. (3) Individuals who supervise shall prohibit any of their professional staff from providing services that exceed the staff member's competence, considering the staff member's level of education, training, and experience. Asking or expecting an SLP to ignore these rules puts them in the very difficult position of obligatorily reporting violations. (14) Individuals who have reason to believe that the Professional and Ethical Standards have been violated shall inform the Board.